Note: You can enter this giveaway one (1) time per e-mail address per day. Deadline is 11:59PM ET 11.19.18. 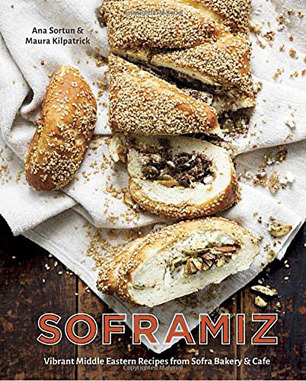 We’re pretty sure Scheherazade would redo her tales into foodie stories just so they could be filled with the dishes found in this collection from the Sofra Bakery and Café. The 100 recipes showcase modern Middle Eastern spices and flavors in both sweet and savory dishes that are perfect for everyday eating or entertaining. Whether you’re in the mood for Morning Buns with Orange Blossom Glaze, Eggplant Manoushe with Labne and Za’atar, or something else — they’re all here and completely accessible by home cooks. Essential ingredients and techniques are explained making it so easy to transport yourself to a Middle Eastern kitchen. Sweet Pumpkin with Walnuts and Yogurt and Cucumber Dip are two recipes that are simple to make yet filled with the flavor of Middle Eastern cooking. NO PURCHASE NECESSARY TO ENTER OR WIN. Void where prohibited by law. Open to legal residents of the 50 U.S., D.C. and Canada (excluding Quebec) who are at least eighteen years old at the time of entry and have internet access. Begins on 10.29.18 at 12:00:00 a.m. ET and ends on 11.19.18 at 11:59:59 p.m. ET. To enter this giveaway, submit your full name and email address on this form. Odds of winning this giveaway depend on the total number of eligible entries received. Only one (1) entry per email address per day. Sponsored by Leite’s Culinaria, Inc. For more information, visit our Official Rules. For a list of winners, check out our Very Happy Winners page. Be sure to add giveaways@leitesculinaria.com to ensure notification if you are the winner.